How head-spinning would it have been for an unsophisticated Belgian nun in the 1960’s to see herself portrayed on the movie screen by superstar Debbie Reynolds, after already experiencing the wonder of having a huge #1 hit record? We can only guess, but Soeur Sourire (Sister Smile) as she was known, would soon leave the convent behind and spend the next two decades living a troubled life that spiraled downward before coming to a tragic end in 1985. Born Jeanne-Paule Marie Deckers near Brussels, Belgium, and mostly known as Jeanine while growing up, she was a devout catholic and thought about becoming a nun, but didn’t take that route at first. As a teenager in the post-war years she began studies to become a teacher but also had a musical side, learning to play guitar and often singing songs she’d written. She did become a teacher for a while, but in 1959 — by then in her mid-twenties — she made the decision to join the Missionary Dominican Sisters of Our Lady of Fichermont, located in rural Belgium. Upon entering the convent she took the name Sister Luc-Gabrielle and also took a vow of poverty, but she didn’t leave her music behind. Within a few years she began to draw some attention while singing and playing for church groups, and an arrangement was arrived at that would allow her to perform professionally, with her paychecks going to the church. Initially her identity was mostly kept under wraps, but when a record company got into the act and had her make an album of her music, she began to attract more notice. When one of the cuts — “Dominique” — shot up the charts, even topping the Beatles , the momentum built to an explosion. The song became an international sensation and Soeur Sourire (Sister Smile), as she was then called, was probably the most famous unknown person around. She would not (could not?) appear in person, although Ed Sullivan managed to show a video of her on his TV program, and that probably added to the public’s fascination. She received a lot of fan mail — some of it highly inappropriate — but she mostly ignored it, and of course the record royalties kept flowing into her religious order back in Belgium. (Although a larger portion went to the record company and a host of producers and the like.) Inevitably Hollywood got into the act and did its usual thing by putting together a feel-good movie starring Debbie Reynolds as ‘Sister Ann’ and Ricardo Montalban as a priest. 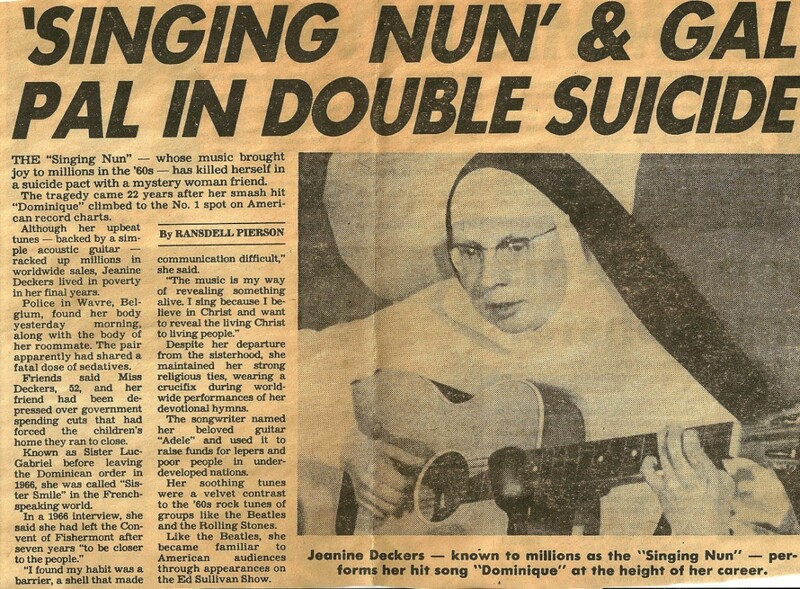 The real Singing Nun dismissed it as ‘fiction’ and it mostly was just that. But things were changing for Sister Luc-Gabrielle, and she would later allude to differences with the church among the reasons that caused her to leave the convent in 1966. By then she’d recorded a second album but it did poorly, and that would also have added to the strife. Although she still considered herself a nun at that time, and lived a pious, chaste life, she was forced to give up the Soeur Sourire name and also could not call herself the Singing Nun. Any performing she did was as Luc-Gabrielle, but she never really found much professional success after that. But her life was much different in other ways. Not long after leaving the convent she reconnected with Annie Pescher, a girl she’d mentored many years earlier when she was a youth counselor. Although there was an eleven year age difference, the duo clicked and were soon living together, but in a platonic relationship — at least at first. As the years passed, Jeannine became an activist in some of the more forward-thinking church movements, often writing and performing controversial songs. She also worked extensively for charities and later combined with her now-lover Annie to start a school for autistic children. The final sad chapter of the life of the Singing Nun began in the late 1970’s, when she recorded another album, under the name Sister Smile. It didn’t do particularly well but it was also about then that the Belgian government starting sniffing around her finances. Eventually it decided to go after her for back taxes on her earlier earnings. It didn’t seem to matter to the bureaucrats in Brussels that all the money had gone to the religious order and the record company. It was a serious problem that stretched on for years, and could have even resulted in jail time for the beleaguered ex-nun. Her attempts to squeeze some funds from the record company and the church were mostly unsuccessful, although the latter did finally kick in a little. Financial difficulties continued to mount, and eventually the couple had to close their school. With everything crashing around them, the pair made a suicide pact and took lethal doses of pills and alcohol. In the years following, the story inspired books, articles, and an off-Broadway play. In 2009 a movie starring Belgian-born actress Cécile de France was made in Europe, and it stuck closer to the real story than the earlier Hollywood effort. Titled Soeur Sourire (Sister Smile), it was not completely factual but was much more forthcoming about many things, including her years of struggle and her sexuality. We’ll never know, but I’m guessing that Jeanine would have found it less objectionable than the earlier film.